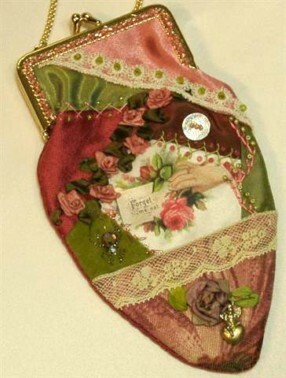 Using a heat transfer tool which is readily found in craft stores, online, and some sewing centers, you can create beautiful color or black and white prints on fabric, paper, wood, or any hard surface. 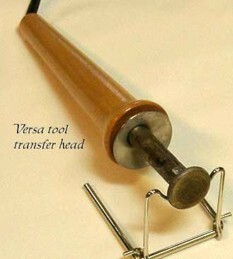 The tool is similar to a soldering iron or wood burning tool and comes with the screw on heads. The flat dime sized circular head is the one to transfer with. You gather any image you have. Family photos, postcards, images from Dover copyright free books, or ephemera from your personal collect and head to your local copy shop. I use UPS store, but have used Copymax. The copier must be DRY TONER LASER. This is the only one that releases the ink permanently onto your surface. The copier I get my copies from is a CCC900 (Cannon color copier 900) the 1700 or 1100 Cannon copier should also work according to my copy guy. Have the copier machine set at Image creation, Mirror image, one shade darker (depending on the lightness of your print) I have used two shades darker before. Fabrics/ I use heavy weight bridal satin in ecru for most of my prints because I am a crazy quilter and the body of the satin is perfect to sew and hand embroider on. I have used Dupioni with great success. The more natural content of the fabric the better the quality your image will be. You will burn or melt a few before mastering this method. Don’t get discouraged, it happens. 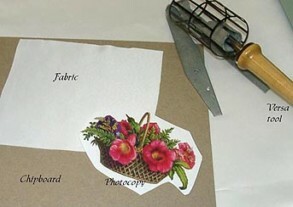 I recommend, cotton (high quality muslin), silk, or Rayon until you get the feel of the tool. These will not melt. A 50/50 blend works well also. I try to use white or cream for my images, however pastels look beautiful too. You now have your heat tool plugged in for at least 10 minutes, your photocopied images cut out, and your fabric or paper in front of you. I work on my desk with a piece of chipboard from the back of a tablet under my fabric. This helps while you are pushing down firmly to get a crisp image. Lay down your fabric, lay your copy face down centered on fabric and with small circular motions, start at the edge of your copy pressing down and keeping the tool moving. I tend to use the edge of the tool as if I am “scraping” the ink off of the copy. 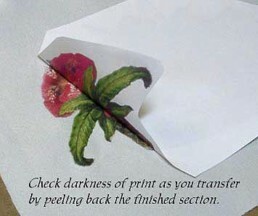 As you move slowly to different areas, lift paper as you go so it does not re adhere to your fabric. If you see your image is too light, you must press harder. Some have said aluminum foil placed under or over the area works for them. Do not touch the tool to the fabric, especially if using a poly. You will have a hole. 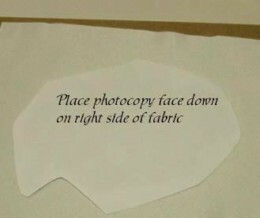 When I have a small image to transfer, I place a sheet of paper over my copy and it works fine. I hope you give it a try. 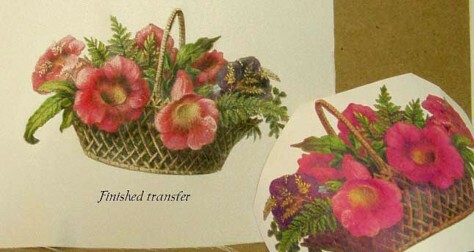 I also transfer images to stationary and envelopes with the heat tool.